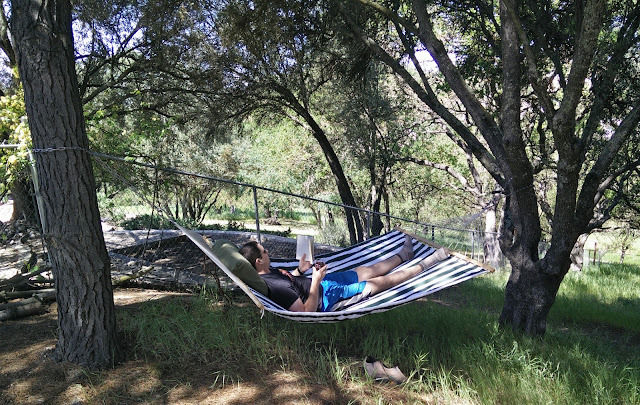 Fiscally Free: We Finally Moved (and Finally Wrote About It)! We Finally Moved (and Finally Wrote About It)! You may have noticed the posts have been pretty few and far between recently. As usual, I have a good excuse--we have been super busy the last couple months, and the blog has been pushed down the priority list. Read on to learn about our big move and what's coming up. And remember, all of this was done with a one-year-old in tow. 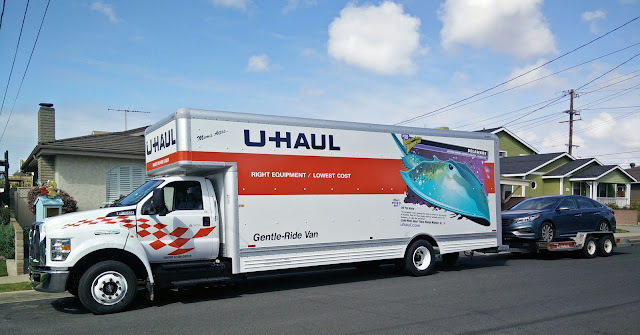 You know you have too much stuff when it doesn't all fit in U-Haul's biggest truck. Dealing with all of this activity has been pretty stressful, but we are finally mostly settled and it is such a relief. It feels like we can get on with our lives again. Although, one of the benefits of all the hustle and bustle is it generated some great ideas for future posts, and now we will actually have some time to share those with you soon. Before we get into that, I'm going to tell you a bit about our move. As you may know, we were living in Torrance, California when I realized "retirement" might be possible in the near future. The one thing that was really preventing it was our location. Torrance is basically a suburb of Los Angeles, where the cost of living (mostly housing) made an extremely early "retirement" very difficult, so we agreed we would be willing to move if it meant we could leave the 9-to-5 grind behind. 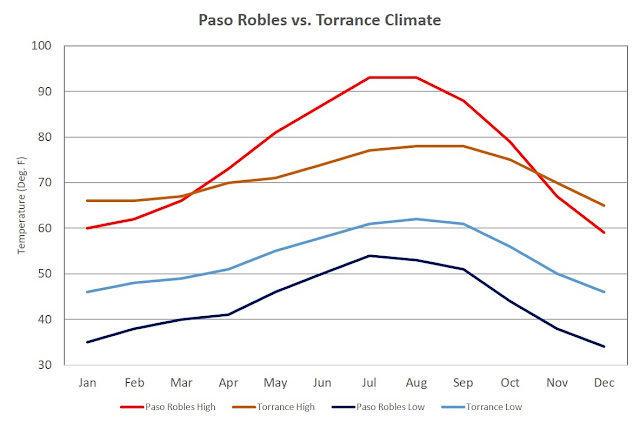 As you can see, there is a huge disparity between the number of pleasant days per year in southern California and everywhere else in the country. To me, that just about justifies the extremely high real estate prices. Anyway, I concluded I didn't want to "retire" somewhere with unpleasant weather, because what good is retirement if I'm just trapped in the house with crappy weather outside. That's not much better than being trapped in an office. That revelation narrowed our choices considerably, to not just the southern half of California, but also to about 40 miles from the ocean, where the weather is best. This posed a significant challenge. We needed to leave southern California to save money, but we needed to stay in southern California to have nice weather. This led to what I like to call the Central Coast Compromise (of similar historical significance to the Three-Fifths and the Missouri Compromises, but less racially charged). That is a compromise between climate and housing prices. In our opinion, California's "Central Coast" currently offers just about the best compromise between great weather and reasonable real estate prices of anywhere in the country, and that's why we moved here. The weather can get a little hot, and the houses are a little expensive, but overall, it's a great place to be. It also didn't hurt that we're now much closer to my hometown and Frugal Babe's grandparents. 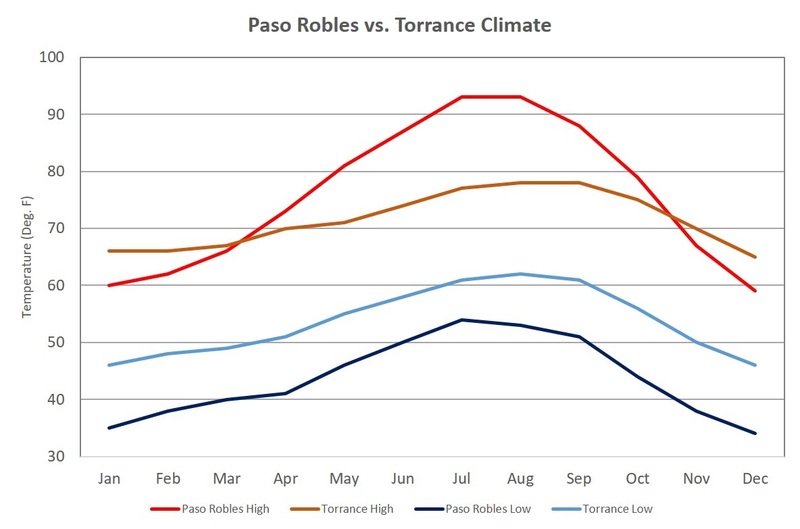 As you can see in the graph below, Paso Robles has a little more variation in weather than Torrance, but it is still pretty comfortable.